As I was looking around online I found another interview that Mike did with Mark Winsor an online radio host. If you check out the video you will have a good idea of how tiring and long the Arizona Trail hike was. At the point of this interview we were about 4 or 5 days away from Phoenix. Well… I made it! The final number of miles hiked on the AZT was 782. It took me a bit longer than we had originally planned with a total of 57 days from start to finish. The 45 days of actual hiking gave us an average of 17 miles a day. Thanks to the help of some incredible guides and with some awesome logistical support I have now become the first blind man to hike the Arizona Trail in its entirety. I could not have made this hike without the assistance I received from The Foundation for Blind Children, friends and family. Also knowing that the hike was benefiting some visually impaired kids gave me the additional impetus I needed to succeed. We raised just under $22,000 for the FBC. Thanks to everyone who donated. You Rock! There were ten guides and four people that ran logistics I need to recognize and thank from the bottom of my heart. Ben Cane and Yancey Herriage were instrumental in this journey being successful. Ben and I spent hours working out the logistics and itinerary. Ben also spent days working on the website and made sure anything involving a computer was taken care of. Yancey really came through with our food from Wal-Mart and picked up the GPS that made life so much easier. He also loaned his SUV to run over 500 miles of logistical support. The three of us hiked the first 582 miles together. The only reason they didn’t make the entire hike was due to time constraints (partially from my injury). The forth man with us on this team was Yancey’s father Anthony Herriage (Sarge). Not only did Sarge do an excellent job of meeting us in the evenings where possible, but he also met us with water throughout the day when needed. He sometimes would hike as much as ten miles to meet up with us. After Ben, Yancey and Anthony had to get back to their jobs, I was fortunate enough to have some amazing people step up to help me finish. My father in law Dave Dicob did an excellent job of logistics. He took care of me and my teams through to the Grand Canyon. I can’t remember the last time I laughed so much. Shane Martinez (a bass player from one of my old bands) guided me for 35 miles. Bob Pelikan guided me through the worst weather of my hike. We spent two of our three days together pushing through rain, sleet, and snow for about 40 of the 65 miles we hiked together. Ben jumped back in to guide me another 60 miles. Cat Isfan led me across the Grand Canyon for a total of 21 miles with me then he turned around and hiked back the next day (Awesome). 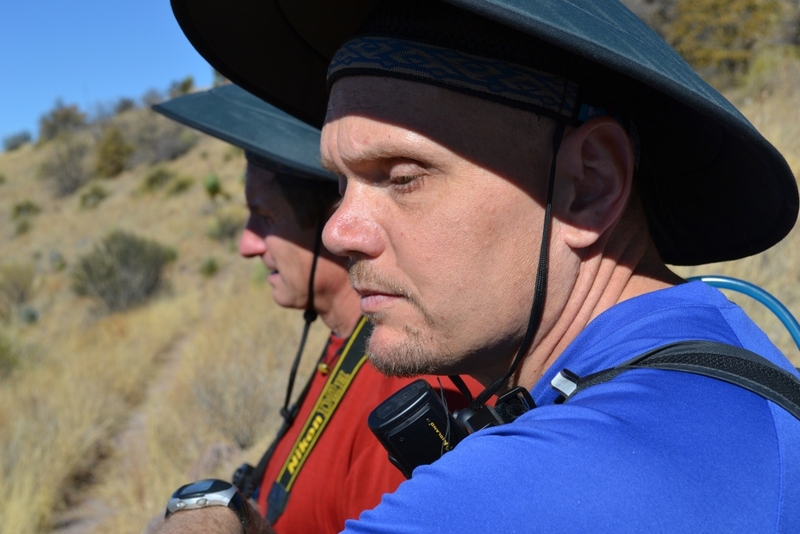 Doug Myster hiked with us to Phantom Ranch and took some great footage of the canyon. Marc Ashton and Tobin Ernst guided me the next 25 miles while Tobin’s father Forest ran logistics. Then the last three days Tom Edwards and Gina Bowman guided me over 60 miles while Barb Edwards ran logistics and basically took great care of us. Thank you all again. There is no way I could have done it without you. This adventure would not have been possible without the love and support of my family. 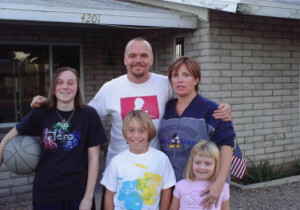 Being away from Tori and the kids was one of the hardest parts of my journey. Hearing their love and support over the phone helped me push through some of the more difficult days. The Arizona Trail was a truly amazing experience. My friends and I were blessed to get to move through some of the most beautiful country in Arizona. When I first thought about the AZT I imagined a whole lot of desert with a bit of forest here and there. This was far from the reality we faced. I was stunned by the sights described to me. I could hear the awe in my guide’s voices as they described the ever changing terrain. One of many things that lifted my spirit was the amount and different types of trees we encountered. There is far more forest in Arizona than I ever imagined. The Arizona Trail takes you through several mountain ranges. You start off with a 3,500 foot ascent of Miller Peak. This brought us in to some snow at an elevation over 9,000 feet. The next major mountain we hit was Mount Wrightson at a bit over 8,000 feet. Then Rincon (day nine) a gnarly hike to 8,400 feet giving a breathtaking view of the lights of Tucson. Then you still have Mt. Lemon, Four Peaks, Mount Peely, Mazatzals, the Mogollon Rim, The Grand Canyon, Sabino Canyon and Mount Humphreys. These are just a few of hundreds of hills, valleys, canyons and mountains we hiked on, over, around or through on the AZT. 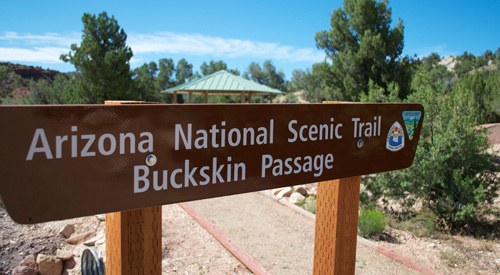 I absolutely recommend to any outdoor enthusiast to check out some or all of the AZT passages. You will be challenged at times, but you will not be disappointed. One does not have to see the view to appreciate the magic found in our amazing state. You can quite literally find any kind of landscape that touches your soul. The big question everyone has been asking is what’s next? There are several adventures in my future. The next big challenge facing me is writing. I have started my autobiography. This endeavor will take more commitment than Kilimanjaro, Rim to Rim to Rim or even the AZT. After that I am planning on a tandem bike ride from coast to coast, climbing Mt. Whitney, participating in an Iron Man competition and a few more long hikes. The Lord only knows where this will all lead. Now that I am back home and getting back into my life’s normal routines, I feel like this trek changed me in some fundamental way. I can’t put my finger on how or what it is, but when I figure it out, I will let you know. Thanks for following my story and Thank you so very much for all the prayers and well wishes sent my way. I felt the Lords guiding hand making it possible for this blind guy to make such a crazy journey a success. We were all truly blessed. Fox 10 did a story on Mike Armstrong yesterday morning, check out the video below to see it. An Arizona man has just completed an 800 mile hike across the state, and what makes this story so inspirational is that he did it without the benefit of sight. FOX 10’s Kristin Anderson talks to the hiker, who is blind. Earlier today I was privileged to guide Sensei Mike Armstrong across the Arizona/Utah border. 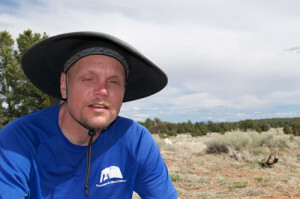 In the past 57 days Mike has hiked 782.3 miles and became the first blind man to hike the Arizona Trail end to end. When we first set out on this adventure we realized it was ambitious and as we made our way up and down the hills and deserts in the south, climbed over and under trees in the Mazatzals, weathered freak snow storms outside of Flagstaff, and crossed the Grand Canyon rim to rim. We realized this adventure wasn’t just a long hike through Arizona. It was a life altering journey of hardship through hiking, and the beauty of the Arizona landscape that while Mike cannot see; he was able to experience in a way only a handful of people can share. While the journey was longer and more treacherous than we imagined, we hiked on. Even with injuries and overwhelming homesickness Mike Armstrong tasted bitter and hiked on until his journey was complete. Now that the trail is complete he can finally take a much needed vacation with the family he has missed dearly. Congratulations Sensei Mike Armstrong, you have inspired me and many more with your dedication and perseverance. Passed the 750-mile mark of the Arizona Trail today. Team Armstrong will complete this 807-mile journey at noon Saturday. FBC CEO Marc Ashton hiked with me for 22 miles Wednesday along along East Rim of Grand Canyon–finished in under 10 hours! We finished off 24 miles and arrived in Tusayan, we got to the hotel about 7pm and enjoyed a steak dinner. Both Sensei’s feet are sore and mine are pretty well blistered. We are both tired but we only have 10 miles tomorrow where we will arrive at Yaki Point. Checked in with Mike last night; even though him and Bob Pelikan (Sighted Guide) were covered in SNOW (yes it does snow in Arizona) and hammered with strong winds they reached their 24 mile goal in time to enjoy a hot shower and dinner in Flagstaff as a reward. Mike has told me that his leg is feeling great and he is ready to push out 20+ mile days from here on out. He also said that the terrain has gotten a lot easier as the northern part of the Arizona trail is known to be much more travelled and less rugged than the southern sections. I will keep everyone updated on his progress as I find out, and I will be joining Mike to guide him from Saturday – Tuesday so you can expect Spot Checkin’s again starting Saturday. Just checked in with Mike Armstrong’s logistics support and even though the GPS was giving them issues Shane and Sensei Mike have completed 21 miles today. Sensei Mike’s regular guides Ben and Yancey unfortunately had to return to work today. Luckily other guides have stepped up to help guide Mike to the finish line. Sensei Mike is on schedule to finish on Saturday, May 28th. Evidently our spot messages for the past few days didn’t go through but we have now finished Passage 25 and we are one day away from Strawberry/Pine. We stayed at LF Ranch last night and it was awesome. Great food, a hot shower, and a bed was great! We just met with Sarge for resupply and we are eating real food tonight.